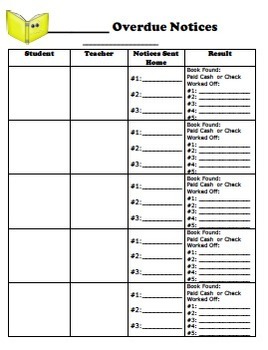 Results column to notate if books was found, paid for (cash or check), or if book was worked off (5 slots to write in the date). 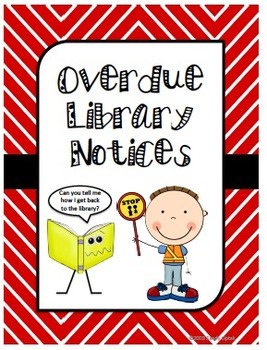 **I have my students work for one week in the library at various jobs to cover one lost book. If they come four days in a row, I give them the 5th day free. So far, this has been much more manageable. It also allows me a quick way to look back over the whole 9 weeks to see which classes were having problems keeping up with their library books, so that I can follow up with them before the start of the next 9 weeks. I also use this information to figure out which classes earned “trophies” for having their library books turned in on time. I included the front and back binder covers as well as the spine to create your own management binder. 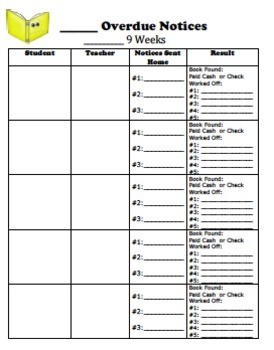 Updated 4/5/16 to included record sheets for PreK-5th Grade stating ____ 9 weeks so that you can write in which 9 weeks it is. 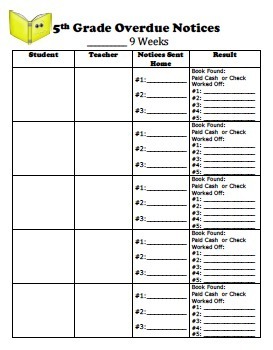 I also included a blank versions for each grade level that don't specify a 9 week period, as well as a completely blank form in case your school goes beyond 5th grade.